Anglers Guide Service offers fishing trips on the premier waters of Western Washington. Whether you are after Big Chinook Salmon, the Elusive Steelhead or the Feisty Coho Salmon we have a trip to cover all your wants and needs. With 2 Jet Boats, 4 Drift Boats and 2 rafts we cover the largest of rivers to the smallest of streams. We can accommodate the single angler looking for that personal trip or the large corporate trip to please your clients with some great fishing. The Olympic Peninsula streams are for the person or groups that are looking for that nice quite float down the river while fishing and learning the finer points of angling for Salmon and Steelhead. These trips take place in our heated custom Hyde Drift Boats or one of our specialized custom rafts for the low water or getting into those tougher spots that the hard boats can't. With the first rains of the fall the Chinook and Coho Salmon stream into the rivers with reckless abandoned. Shortly after Thanksgiving the Hatchery winter steelhead show up to battle anglers with there great leaps and quick runs. Then After Christmas the first of the Native steelhead show up and then build in numbers as the winter grows on. The Native steelhead is the crown jewel of the Olympic Peninsula with there awesome size and power running into late April. The Southwest Washington streams like the Mighty Columbia, Cowlitz, Lewis or Kalama rivers are more designed with a jet sled in mind( except Kalama). With the use of our Custom 25' and 23' Alumaweld Super Vee's we can take a group of anglers and put them on top of some of the states best Spring, Summer or Fall Chinook runs, Summer Steelhead and Sturgeon of the Columbia. 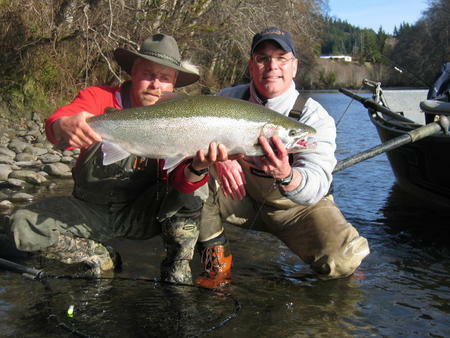 The Lewis and Cowlitz Rivers host these same great runs of fish just in a smaller scale. These streams fish better in the spring time and through the summer months when the smaller streams of the Olympic Peninsula are to low and clear. The Kalama host one the better runs of Spring Chinook and summer steelhead in the state is most easily accessed with the use of one of our Drift Boats.